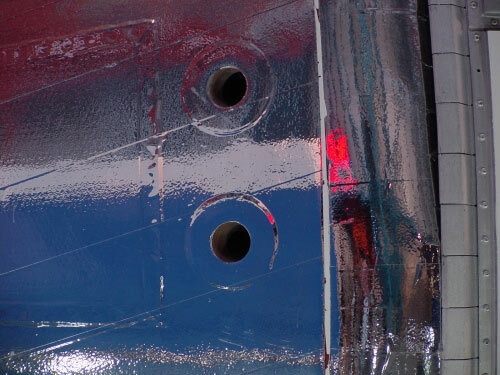 [QUOTE]Originally posted by FutureAstronaut: [b]The entire Command Module was covered in these silver mylar sheets? always though it was solid metal[/b][/QUOTE] The parts of the CM exposed to space were covered in the silver mylar; I don't believe the bottom heatshield was (as it was covered by the SM during flight). Under the mylar (which is just a thin foil) was the same basic heatshield material as the bottom (what most people think of as "heatshield"). Here's a detail of the unflown CM at KSC's Apollo/Saturn V Center which shows the foil applied in diagonal strips: The Apollo Experience Report on the NTRS regarding the [URL=http://ntrs.nasa.gov/search.jsp?N=0&Ntk=all&Ntx=mode%20matchall&Ntt=tn%2Bd%2B7564]thermal protection system[/URL] has bunches of info on the Apollo CM TPS. [QUOTE][b]Is the mylar the same thing as kapton? [/b][/QUOTE] Hmm, good question. I guess I usually think of them as interchangeable. The TPS document referenced above refers to it as "Kapton." [QUOTE][b]What was used on the LM? This had a gold tone, and was never through reentry. [/b][/QUOTE] The various foils were chosen for their thermal and/or micro-meteoroid protection properties. The [URL=http://history.nasa.gov/alsj/a11/a11LM5structures.pdf]Lunar Module Structures Handout[/URL] on the ALSJ has various diagrams of the coverings used on the LM (although not much background information). And this doc refers to "mylar" instead of "Kapton." But, there's [URL=http://ntrs.nasa.gov/search.jsp?R=255123&id=1&qs=Ntt%3D19690055315%26Ntk%3Dall%26Ntx%3Dmode%2520matchall%26N%3D0%26Ns%3DHarvestDate%257c1]another document regarding the LM[/URL] referred to on, but not available through, the NTRS which refers to both "mylar" and "Kapton." So, I guess there is some difference, and it's a matter of "the right tool for the right job."